Tokens were dropped into a slot on the turnstile in order to enter the subway and NYC's destitute needed a way to get on the trains for free. When they aren't simply walking in through the emergency exits (because they were eventually chained closed), the bums/crack-addicts were devising methods to retrieve the inserted tokens. By shoving paper or matchbooks into the slot, the crafty thieves stopped the tokens from falling in and registering the fare. The name token suckers comes from how they got the them out [source] [source]. To combat the problem, police kept arresting the perpetrators until that got old. After getting virtually nowhere the cops and service attendants learned to either spray mace on or pour hot pepper in the coin slots. 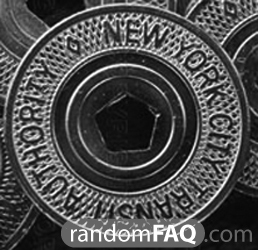 Although it didn't eliminate the problem, it did begin to wean down until the MetroCard came to replace tokens altogether.